"The American people are sick and tired of hearing about your damn emails!" This remark of Bernie Sanders' about Hillary Clinton's emails from last October will probably go down as the quotation of the 2016 election, and it's even more true today than it was a year ago as the cable media continue to give wall-to-wall coverage to the "email controversy" to give her contest with Donald Trump the appearance of closeness in these last two weeks. I felt I needed to grab and preserve an image of the following tweet from the entity tweeting as "@realDonaldTrump" this morning before it is corrected. 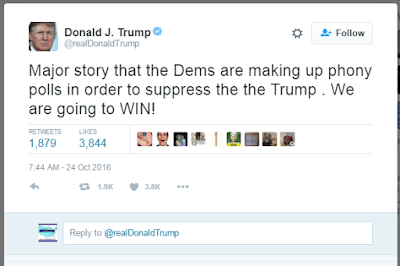 Not only is the idea of "phony polls" supporting his fiction of an upcoming rigged election classic Trump, as is the capitalized "WIN!" and the citing of an unnamed "major story" to support his unsupportable rant, but it reaches legendary Trump tweet status with the vaguely Freudian typo about his fear of people out to "suppress the the Trump." The combination of egotism and paranoia in that strange combination of words needs professional exegesis, but it's clear that this tweet belongs in his hall of twittering fame. Leonard Cohen in the Record Stores Today! I'm heading out to buy my copy at lunchtime. Back on August 13, I asked here, "Is there any proof that Donald Trump ever voted (before voting for himself)?" There were real reasons two months ago that I had to bring his familiarity with the process into question. This morning, however, I stumbled on this video of a very short-tempered Donald himself actually voting (or attempting to vote) at various locations on the Upper East Side in November 2004 ... with a camera crew and the notorious Billy Bush at his side. While he does finally vote (or at least fill out a provisional ballot) by the end of the video, this still doesn't inspire a lot of confidence about his knowledge and familiarity with the mechanics of the process that he is now loudly questioning. The frame of this video is interesting too. Billy Bush and his co-host Kit Hoover at Access Hollywood are in the studio on election day of 2012 looking back at Donald's antics of 2004 and giving an update about Donald's current (2012) racist attempt to get Barack Obama to release his college transcripts and passport documents. The first was, of course, her "When they go low, we go high" speech at the Democratic National Convention. Happy 99th Birthday to Thelonious Monk! "Round Midnight" from the Thelonious Monk Quartet (with Charlie Rouse, tenor sax; Larry Gales, bass; and Ben Riley, drums) live in Norway in 1966. Familiarity with Monk should be part of every American's education. This is what makes America great in the eyes of the world. You hate to hit a man when he's down ... unless that man is Donald J. Tr*mp. I saw the following favoriting of a tweet show up in my Twitter notifications today and I was a little bit confused, because I did not remember responding to a tweet of @realDonaldTrump's about Hurricane Matthew currently off the coast of Florida. @realDonaldTrump Really?? You are now officially the worst human being now living on the planet. Congratulations on your victory. It took me a moment to note the 2012 date and realize that this was my response to Donald Trump using Hurricane Sandy as his reason for extending his racist call for President Obama's college and passport documents. Again, not to be all trumpy and braggadocious* about it, but I'd like to pat myself on my own back for pointing out that Donald Trump was "the worst human being now living on the planet" four years before that simple truth became a universally-acknowledged fact.